Researchers at the University of California, Berkeley have devised a new 3D printer that shapes objects with rays of light. The 3D printer is nicknamed the “replicator”, a tribute to the famous Star Trek device that can materialize any object on command. Credit: UC Berkeley photo by Stephen McNally. 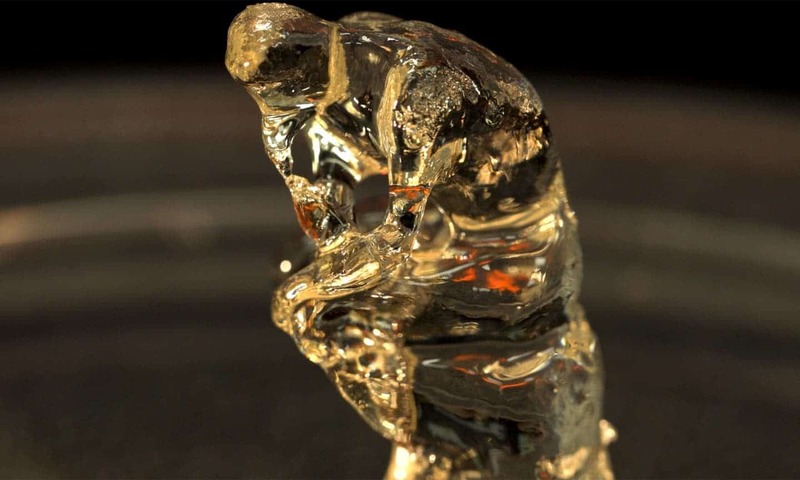 Photo-activated 3D printing isn’t exactly new but unlike previous devices that harden resin layer by layer, Berkeley’s 3D printer prints an object “all at once.” This means that the resulting objects are much smoother because there is no “stair-step” effect along the edges. Structurally, the printer’s objects are also more versatile, accommodating bendable objects or shapes that would otherwise require support, such as an arch, to hold it together. The “replicator” can also print over an existing object — such as the handle onto a metal screwdriver shaft. According to the researchers, led by Hayden Taylor, assistant professor of mechanical engineering at Berkeley, all of these properties suggest that their printer could make anything from prosthetics to eyeglass lenses — all while capturing very fine details. “I think this is a route to being able to mass-customize objects even more, whether they are prosthetics or running shoes,” Taylor said in a statement. “The fact that you could take a metallic component or something from another manufacturing process and add on customizable geometry, I think that may change the way products are designed,” he added. The researchers’ replicator is like a computed tomography (CT) scanner in reverse. A CT scan reveals tumors and fractures inside the body by projecting electromagnetic radiation from different angles. Then, a computer analyzes the patterns of transmitted energies to digitally reconstruct an object. By applying the same theory, only in reverse — creating an object, rather than measuring it — the researchers used a video projector that patterned light onto a rotating cylinder of liquid. The resin was carefully formulated such that it stays liquid when exposed to low-intensity light but turns solid when the intensity is cranked up. The patterning of light was another challenge, requiring complex calculations to get the desired shape and the light intensity just right. Ultimately, the researchers settled on a liquid polymer called acrylate mixed with photosensitive molecules and dissolved oxygen. When light is shone onto the resin, the photosensitive compound becomes activated, depleting the oxygen. In these regions, the polymers from cross-links that solidify the resin. The unused resin can be recycled and used at another time. As a demonstration, Taylor and colleagues 3D printed a tiny replica of Rodin’s masterpiece, “The Thinker”, as well as a jawbone. The researchers say that their technology is scalable, with a low barrier of entry for manufacturing. The findings appeared in the journal Science.